Talal is a serial entrepreneur and senior technical executive with a proven record of successful accomplishments in creating and delivering complex and scalable solutions over more than 20 years in the communications technology industry. His experience includes developing and growing a variety of businesses from inception to leadership in their industries, and bringing enterprise products to market on time and under budget. He cultivated and applied this expertise in SaaS_, _Telecommunications, and MedTech at enterprises ranging in size from start-ups to NASDAQ-listed global leaders. In recent years, he has focused on the use of cutting-edge technology in SAS, TeleHealth, and Augmented Reality (AR) to implement complex Healthcare solutions to benefit the well-being of patients across borders and continents. Before joining Back Bay Group, he founded Proximie LLC, which provides an AR medical platform to facilitate Telesurgery (enabling remote surgeons to ‘assist’ in an operation from afar via the platform) and medical training (enabling medical students to learn about world-class surgical techniques through a richly visual and interactive platform) between geographically disperse surgical professionals. The company’s cloud-based platform integrates these AR features seamlessly with appropriate sharing of data such as patient records, to comprise a complex Health care solution that has been successfully deployed in Latin America and the Middle East & North Africa (MENA) region. 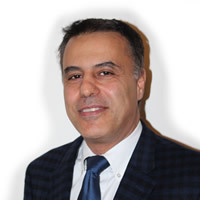 Prior to Proximie, Talal founded vCentrix, Inc., a provider of hosted VoIP solutions – such as lines, trunks, and toll-free numbers, as well as Web-based OSS toolsets – to telecom service providers. As the company’s Chief Technology Officer, he led the technical team to create a carrier-grade voice network based on SIP based SoftSwitch and supporting OSS/BSS systems. The cloud-based network supported national and international customers, and in March 2009 became an operating subsidiary of Momentum Telecom Inc. Prior to vCentrix, Talal was Director of IP Technology at iBasis, Inc., a pioneer in the use of IP for real-time communications since its inception in 1996 as one of the first international wholesale Voice over IP (VoIP) carriers. In implementing the technology development from an idea to commercial roll out, he created new products that met customer requirements and worked with a worldwide sales team to market and promote them. He also was responsible for the deployment of cloud-based applications in 75 data centers in Latin America, Africa and the Middle East to create carrier grade VOIP service. The company rapidly grew to be one of the largest carriers of international voice traffic in the world and – a decade after its IPO on the NASDAQ market – in 2009 became a subsidiary of Royal KPN N.V., the national carrier of the Netherlands.